Love this comic strip (Friendly Atheist? 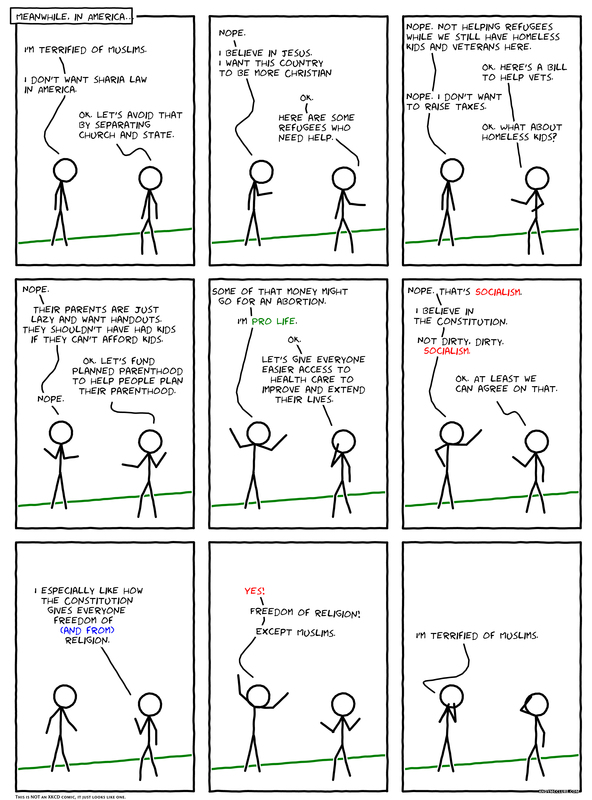 ), which someone posted to Facebook recently: the hypocrisy of a religious conservative in nine panels. The New York Times reports on the turmoil inside the Trump White House. The shocker: Trump didn't know he was signing an order that put Steve Bannon on the National Security Council. A New York Times sportswriter ran into Steven Bannon at the airport after the election in November, and guess what he was reading? I doubt he learned the right lessons from it. Maybe he thought it meant Trump needed to hire the worst and the dimmest? Longtime WA state Republican Chris Vance on why he's marching against Trump. He also has a good rundown of the anti-immigration executive order, its dog whistles, and its longterm potential consequences. Trump displays autocratic tendencies (dismissing voters and protesters), while his media mouthpiece, KAC, insists he deserves better coverage no matter how much he (or she) lies. Jonathan Chait is on it. Adam Gopnik on Trump's anti-Americanism, and how Trump's incompetence is a feature not a bug. Gopnik also tosses in some necessary words from James Madison: Federalist No. 51 rather than “We are engaged in a battle for our nation's very soul/ Can you get us out of the mess we're in?” Although that works, too. My former editor for book reviews at The Seattle Times, Mary Ann Gwinn, bids farewell to the newsroom. Great exchange between my man Ricky Gervais and my man Stephen Colbert about religion. Stephen's Catholic, Ricky's atheist/agnoistic. I'm with Ricky. It's always posited as not believing in God but that's not the issue; it's people I don't believe. Another year, another Patriots victory in the Super Bowl. Blech. Thankfully, The Onion is on our side. It's no longer Democrats vs. Republicans but people in the reality-based community vs. propagandists and liars. For the former group, here's Randy Rainbow singing “Fact-checker, Fact-checker” to KAC but for us. My name is Erik and I work from home.